The majority of small business owners spend an increasing amount of their days on their phone. In fact, I’m writing this blog post from my phone. We all have places to be and, quite often, it’s not in front of a computer. So how do you get things done on the go? Apps, of course! The amazing thing about being able to take your entire business with you on the go is that it up levels your client’s experience of you. Easy communication + simple solutions = Happy Happy Happy Clients. New apps are being developed daily but there are a few I just can’t live without. Watch the video below to learn exactly how I use these amazing apps to increase my own productivity. My go-to scheduling app, Sunrise is on my computer, my iPad, and my iPhone. Sunrise is a cleaner interface (read: prettier) than the standard iOS calendar and it integrates all of my other day-to-day appointments and tasks via Facebook and Asana. If you’re like me, you’re constantly consuming articles and other media. And it’s almost too much to keep up with! Pocket allows me to save the articles I want to reference and read them later. I flip thru my Pocket when I’m having coffee in the morning, waiting at a doctor’s appointment, or just want to take a moment to stop and read. Pocket also gives me the ability to add tags and highlights to the articles which takes it one step further than a standard reading list. This app saves our household from tons of strife! With AnyList, my husband and I can easily share a grocery shopping list and it’s organized by section of the store. I can send him to pick up a few things and add to the list while he’s driving there and it syncs almost instantly. I can also save recipes to grab the ingredients and save master grocery lists I can use again and again. Of course I’ll mention that Asana has an app! It’s organized in much the same way my online Asana account is and it’s easy to navigate. I can check things off with clients, add comments, and even add tasks to my own to-do lists. Last, but not least: Evernote – It’s what I use to compose most of my blogs! Evernote is great for longer term storage for reference points (better than Pocket for this particular use) and also has the ability to allow for sharing with clients and family members. And now it’s your turn! 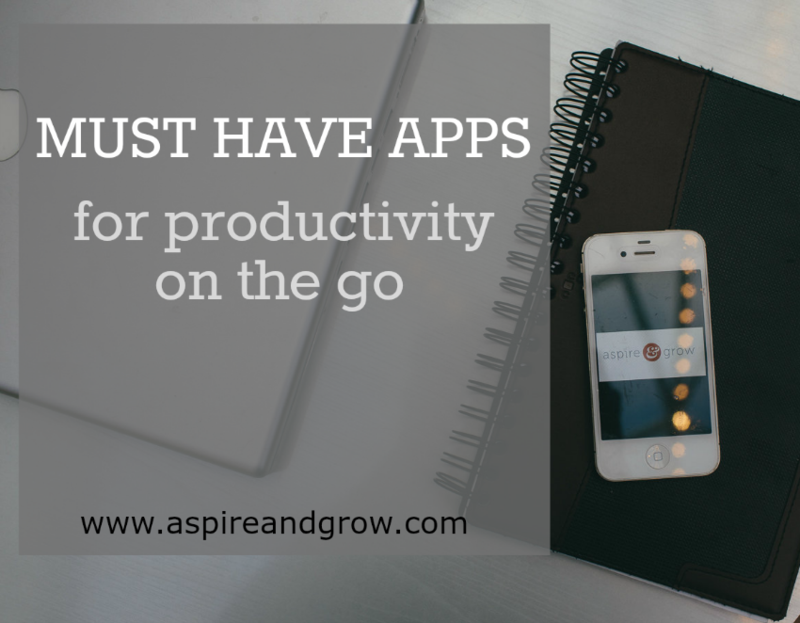 Tell me in the comments below what your favorite apps are for productivity on the go.